Our menu is wide & varied, catering well for vegetarians. We can also cater for most dietary needs if given some notice. All our food is cooked by our award winning chefs using local produce wherever possible. You can enjoy your meal either in our original slate floored bar areas, or if you prefer waitress service, book a table in our restaurant. Check out our lunch specials at great prices! The beer garden is at the side in a former orchard, and a beer terrace is across the road opposite. 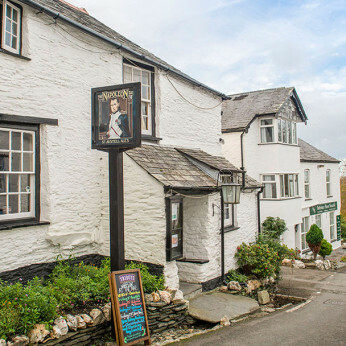 If you are looking for great ales, decent wines, good coffee, friendly service, great food, cosy rooms with log fires on cold evenings and over the winter period look no further than the "Nap"
Children and dogs are are also very welcome!